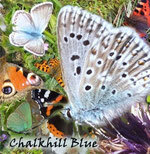 So who, or what, is Chalkhill Blue? Chalkhill Blue is a musical project devised by Graeme Stroud, a multi-instrumentalist and amateur naturalist from Gravesend in North Kent. What is the musical background? Graeme took piano lessons as a kid, but only really became interested in playing music when introduced to the guitar in his early teens. Exposure to blues, rock and other musical influences happened at about the same time, and Graeme first performed as a lead guitarist in public at a wedding at the age of 15. After playing at a number of social events and one-off gigs over the next few years, Graeme started playing in gigging rock bands in the early 1980s, on the back of the rock new wave then at its height. Further collaborations, duets, trios and one-offs followed, but Graeme had stopped playing regularly in public by the early nineties. He never stopped playing the guitar though, and even resumed playing the piano. His guitar gear was stuck in a 1980s time warp, but his keyboard playing received a big boost with the acquisition of a Roland digital piano in 2008. What is the nature background? Graeme has always been interested in nature; aquatic creatures particularly caught his imagination when he was young. 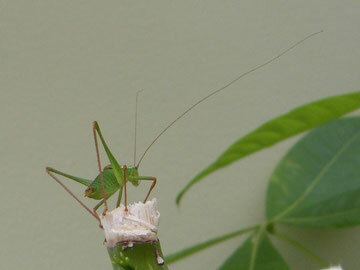 But his interest was particularly piqued at a young age by a neighbour who showed him how to find insects and other creatures by lifting the loose paving slabs in the garden and looking underneath. 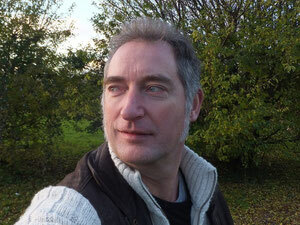 Digital photography was the thing that really kicked it off as a hobby though, and Graeme started writing a nature journal in 2004, largely based around the patch of waste land close to where he works, starting with wild flowers, then particularly working up an interest in insects. The idea is to create music that reflects his love of nature. The dignified calm of the soaring falcon, followed by its jaw-dropping descent in pursuit of its prey, the strength and majesty of the red stag, the delicate beauty of the butterfly – nature inspires art! Very nice. You mentioned he has a day job though? Yep – Graeme graduated from the University of Greenwich in 1996 with a degree in Computing Science, and started work as a programmer at a company in his home town the same year. He’s been performing various IT-related support and documentation duties ever since. I bet that helped with the technical production side then? Absolutely. Learning to drive one of these souped-up keyboards is more than just being able to play the piano, especially when the instructions are written in Japanese-English-technical-ese. The initial background tracks are generally played in short bursts, then chopped, copied, cut-and-pasted, looped and messed around with and gradually built up into a coherent piece. Then further instrument sounds are layered on top. It’s part of the wonder of the digital age . . .
And then the same with the guitar parts? Nope – the guitar is strictly analogue, and is recorded in one hit over the top of the finished backing tracks. No, we’re in strictly instrumental territory here. At the time of writing, anyway. 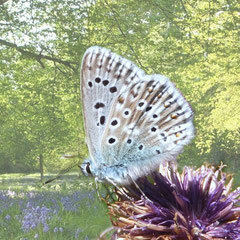 So why the name Chalkhill Blue? Well, chalkhill blue is the name of a small butterfly that, unsurprisingly, lives on chalk hills, so it fits in nicely with an interest in nature, particularly insects. Furthermore, Gravesend sits on the edge of the North Downs, a range of chalk hills running north-west to south-east through Kent, so these could be considered the artist’s natural habitat. Finally, there is the glancing reference to the blues, the origin of most or all rock music, and one of Graeme’s great loves. 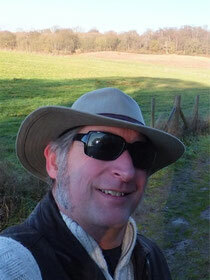 And thus Graeme Stroud morphs into Chalkhill Blue . 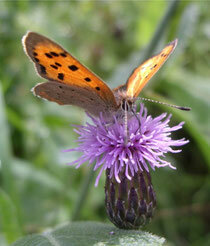 . .
Is Chalkhill Blue rock music then? I suppose that really depends on your definition of rock music – it’s nowhere near the frenetic metal-based rock of his youth, although he still loves that genre! Chalkhill Blue is more mellow, built around the capabilities of the keyboard as much as anything. It absorbs influences from a wide range of styles, from classical, through blues, folk and rock, right up to out-and-out prog epics. You’ll even find some funk and hip-hop influences. Nothing is out of scope. How would you define it if you were pushed? Ambient progressive. That seems to sum it up. Well can we listen to it then? Sure. Just click the album link at the top-right of this page and follow the instructions. Many thanks for taking the time!